Bennett's Sandwich Shop is an EXPERIENCE. Opening for the first time just blocks away from Kennebunk Beach in July of 1982, we quickly became a Sandwich Institution. The quality and freshness of the ingredients, the extraordinarily welcoming service, and our mouth-watering sandwiches is UNPARALLELED. We now offer the same extraordinary EXPERIENCE in Portsmouth, NH and in Boston, MA. We are proud to be a family owned and operated store and the difference is our Core Values of “Quality”, “Service”, “Value” and “Community” . These values are fundamental to the Bennett’s brand. They are beliefs that Charlie Bennett, the founder and original owner of Bennett’s Store so closely identified with. With each Bennett’s location, Charlie’s legend will live on. Literally the best breakfast sandwich in New England! Our 100% All-Natural steak, served with fried eggs, and melted cheese on our 8" or 12" signature sub roll. Spice it up with our delicious Hot Pepper Relish or our House-Made Siracha Mayo! If you want to get really cRaZy, add our HashBrowns to the sub. A must have on the menu. Served on our 8" or 12" signature sub rolls, in a whole wheat wrap, or on an English Muffin. Another must have on the menu! Served on our 8" or 12" signature sub rolls, in a whole wheat wrap, or on an English Muffin. Delicious ham served as a breakfast sandwich on our 8" or 12" signature sub rolls, in a whole wheat wrap, or on an English Muffin. Supremely underappreciated breakfast meat! Our extraordinary and sliced on freshly sliced all-natural pan roasted turkey breast as a breakfast sandwich. 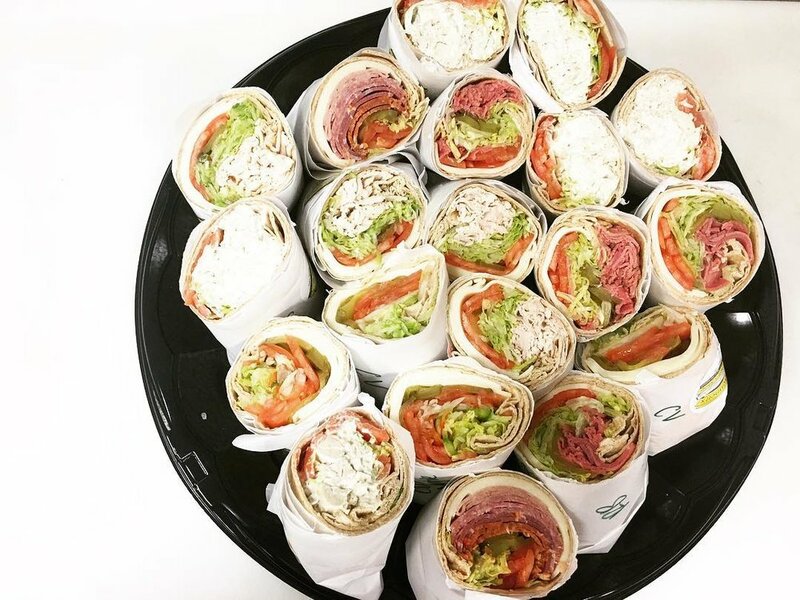 Served on our 8" or 12" signature sub rolls, or in a whole wheat wrap. Spice it up with our delicious Hot Pepper Relish or our House-Made Siracha Mayo! Now this is a Lobby Roll! The "People's Lobby Roll" is over 1/4 lb. of the FRESHEST Maine KNUCKLE and CLAW lobster meat! Try it "The Bennett's Way" mixed with very light mayonnaise, served over a bed of freshly sliced iceberg lettuce in a toasted roll topped with a bit of drawn butter. NOT YOUR FATHER'S LOBBY ROLL! The LOBBY SUB is over 1/2 lb. of the FRESHEST Maine KNUCKLE and CLAW lobster meat prepared on our SIGNATURE SUB ROLL! Try it "The Bennett's Way" mixed with very light mayonnaise, served over a bed of freshly sliced iceberg lettuce with a bit of drawn butter. The Sandwich that made us Famous! Our 100% All-natural sirloin steak is grilled and shaved to perfection and served with melted cheese and your choice of grilled onions, peppers, and/or mushrooms. Spice it up with our delicious Hot Pepper Relish or our House-Made Sriracha Mayo! Another fan-favorite grilled sandwich! Our grilled shaved chicken breast is prepared with melted cheese, and your choice of grilled onions, peppers, and/or mushrooms. Spice it up with our delicious Hot Pepper Relish or our House-Made Sriracha Mayo! Deliciously seasoned grilled strips of chicken breast served with melted cheese, and your choice of grilled onions, peppers, and/or mushrooms. Spice it up with our delicious Hot Pepper Relish or our House-Made Sriracha Mayo! Try it "The Bennett's Way" with melted Provolone Cheese and Yellow Mustard. Try it "The Bennett's Way"! Grilled bacon, melted cheese served with freshly sliced shredded lettuce and tomato served with a bit of mayonnaise. Try our tasty and unique Cheeseburger Sub! Have it "The Bennett's Way" with Lettuce, Tomato, Pickle, Ketchup and Mayo! Delicious 2oz meatballs covered in delicious pasta red sauced and prepared to perfection over melted provolone cheese. Just like Mamma makes it! Try our Famous Italian! Prepared with Genoa salami, Hot Capicola, delicious Ham, and Pepperoni, with your choice of cheese, vegetables, and seasonings. Try it "The Bennett’s Way" loaded with all the veggies, including the hot pepper relish, with oil, vinegar, salt, pepper, and oregano! Treat yourself to our Famous Turkey Sub! Try our freshly sliced all-natural pan roasted turkey breast “The Bennett’s Way” loaded with all the veggies, including the hot pepper relish, with mayo salt and black pepper! Try it “The Bennett’s Way” loaded with all the veggies, including the hot pepper relish, with mayo, salt, and black pepper! White albacore tuna mixed with mayonnaise, with your choice of cheese and vegetables. Diced white meat chicken mixed with mayonnaise and celery salt, with your choice of cheese and vegetables. Bennett’s sandwich shop wants our patrons to enjoy a Bennett’s Sub Wherever they go. No better place than to offer Bennett’s to your doorstep. Please find direct links to our 3rd Party Delivery Vendors in Portsmouth, NH and Boston, MA below. 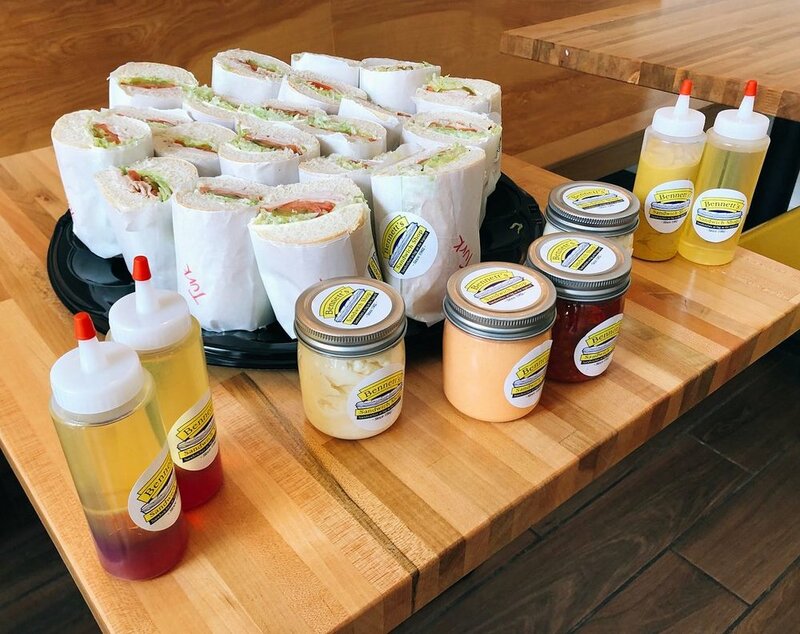 Please note that if you have a large party or catered affair to contact us directly at the nearest Bennett’s Sandwich Shop location so we can best serve your event! Fast, Easy, Economical, and Delicious! WHO DOESN’T WANT TO BE THE MOST POPULAR GUEST AT THE PARTY OR WORK EVENT? WE’VE GOT YOUR COVERED! ALWAYS BE THE COOLEST AT THE WEDDING, OFFICE, PARTY, OR FOOTBALL TAILGATE BY SERVING YOUR FAMILY, FRIENDS, AND WORK COLLEAGUES BENNETT’S SANDWICHES! Please call our Portsmouth, NH or Boston, MA stores when closed for the season in Kennebunk, Maine. Thank you. Open Daily June - August. Now Closed for Season. See you in Summer 2019! Thank you for reaching out to us! 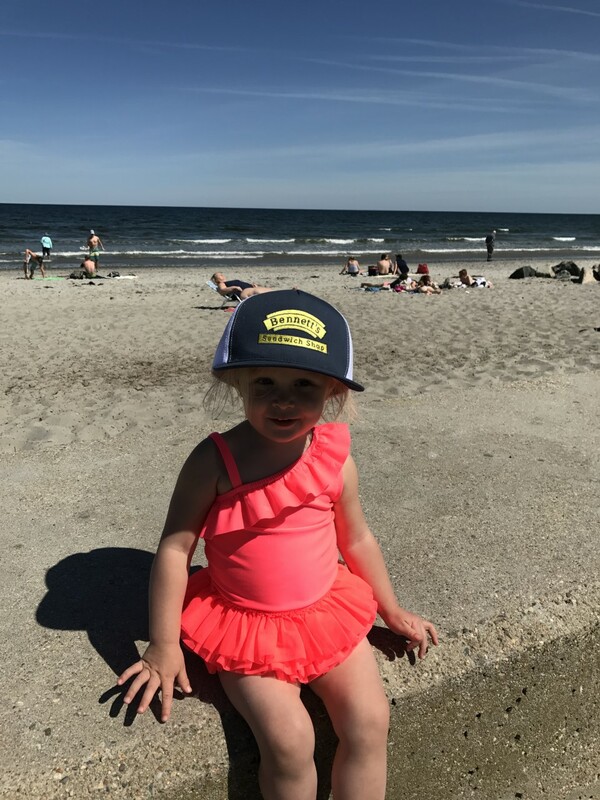 We always love to hear from our patrons whether they have exciting news about a recent visit and delicious sub, if it is an inquiry on gift cards or our very cool Bennett’s Swag, or even if it something we can rectify or do better next time. Either way, we always want to make sure our loyal patrons are happy and appreciate their feedback. We will always try our best to accommodate you. Thank you again for your tremendous support. another BANNER year for THE BEST IN new england! 2015 BEST OF KENNEBUNK AWARD! Bennett’s Sandwich Shop is always eagerly looking for the most charismatic, friendly, and eager team members to add to our great staff. We offer part-time, full-time, and managerial positions. We also offer health insurance and paid-time off for qualified members. We look forward to working with you soon!